Spring is almost over, and it’s time for summer fun! School is out; vacations are on the horizon. It’s safe to say that we all have a lot on our minds. But before we shut the door on spring, let’s take a moment to tidy-up and get ourselves prepared for the next raid tier. This State of the Guild will largely be focused on patch 6.2 and the changes to the Progression Raid team as we move into the upcoming raid tier. Possibly Blizzard’s largest patch in ten years, patch 6.2, scheduled to launch Tuesday (6/23) is dropping an overwhelming chunk of content on our laps. For those on the progression raid team, it is our job to hit the ground running to ensure you are prepared for the new tier. Our veteran raiders are sitting at around 695 iLvl. For those looking to gear up and join the progression team or those on the team that may be a little behind in item level, here are some great ways to quickly increase your item level. At this point in the PTR, the class changes are fairly stable and the class theorycrafters have settled on the best talents, specializations, rotations, and gearing strategies for 6.2. Take the time to read up on your class changes in the 6.2 patch notes and participate in forums discussions either on Warcraft’s website or your favorite fansites (MMO-Champion, Icy-Veins, AskMrRobot, Elitist Jerks). If you do not know the names of your class’ leading theorycrafters, this is a great time to ask the community and get involved in the discussion. Those who have completed their 715 rings will have a continuation quest prompt within their garrison. The new ring will have a shared team ability, so it is especially important that each member obtains their legendary ASAP. 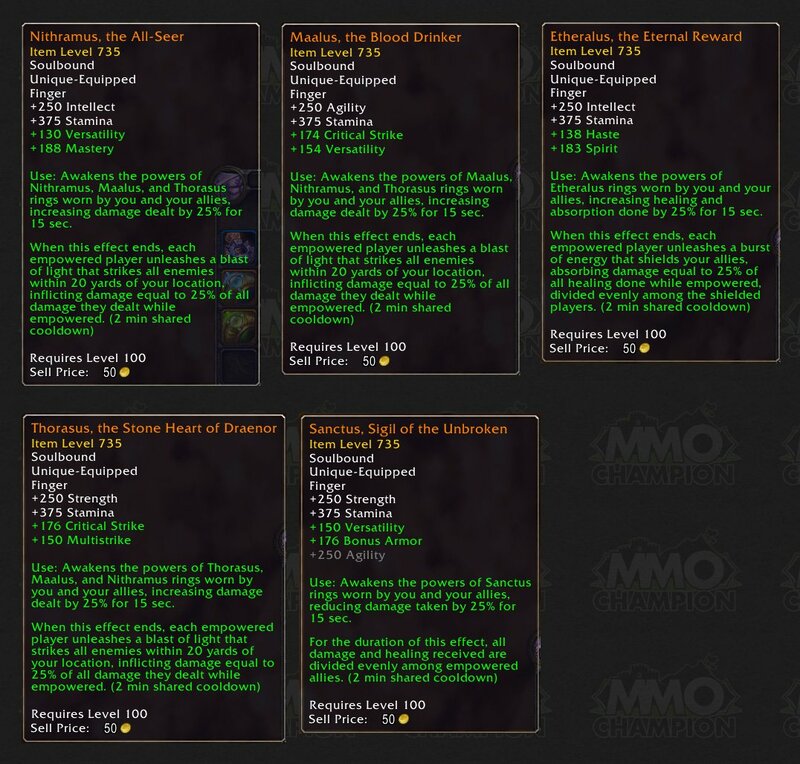 For more info, visit Wowhead's guide to the WoD legendary ring. Beginning in 6.2, epic/purple (+75) gems will be available from the Tanaan Jungle (see this guide for details) which are highly encouraged. Prices will be very high on the auction house, so we recommend you farm them yourself. Although epic gems are not explicitly required, we do highly encourage their use. Rare/Blue (+50) gems are now required for progression raiders. We expect raiders to have read and committed to memory the Icy-Veins strategies for the our intro bosses before Tuesday. Videos are helpful, but there is no substitute for reading each ability. These first four encounters drop 690 gear on normal (705 on heroic). Our plan is to begin in normal-mode HFC and perfect our strategies before switching over to heroic difficulty. We will likely be switching difficulties several times as we explore the mechanics. Your preparation is essential to our team's success. With any new raid tier, our strategies will be unrefined and in dire need of polishing. The more minds we have collaborating: the better! 1. Ahead of the Curve: Archimonde is our foremost priority. House of Zug has a long and perfect history of making our progression goals, and I imagine that our raiders will expect nothing less this tier. 2. The meta achievement for HFC will be our first bonus objective, shall we have additional time at the end of the tier. Hopefully, this tier we will be able to integrate some of these achievements into our weekly farm sooner so that the achievement is less daunting down the line. 3. Mythic raiding remains a low-priority item for House of Zug due to the lack of flexibility. Nevertheless, if we find ourselves with bonus time after our former objectives, and mythic seems like the next logical step in progression, then House of Zug will take that step. The start of a new raid tier is a great time to review your UI, update keybindings, learn new skills, and set higher expectations for yourself going forward. The House of Zug officers have worked hard to create an incredible library of resources in our Raider Academy page. Whether you are a novice or pro, the advice in these tutorials can help you take your gameplay to the next level and beyond! Beginning in 6.2, the House of Zug progression raid team will now be moving away from a signups system in favor of an affirmative assumption. This means that Crusade will mark every Trial, Gladiator, Kor’Kron, and Officer as “Confirmed” unless you specifically contact Crusade and let him know otherwise. A private message on GroupMe is the preferred contact method. We believe this system will be MUCH easier than trying to track down raiders and ask them if they are attending. However, it only works if the officers can trust our members to communicate their schedules in a timely manner. House of Zug is a team; each member plays an essential part in our progression. And while we understand that emergencies and conflicts will occur, no call; no shows are never acceptable given the unbelievable ease of modern communication. Although House of Zug has extraordinarily low turnover, our members are students, professionals, and parents. As such, schedules and priorities change over time. Periodically adding new members to our roster refreshes our team energy, enhances our team composition, and applies gentle pressure to raiders who have grown a little too comfortable in their roles. To help promote this healthy growth, House of Zug is now offering 150 EP for referrals to our progression raid team. The referring player must be rank-3 (Gladiator) or greater to qualify for effort points. The referring player must have played an active and influential role in the applicant’s decision to apply and be noted by the applicant during the initial interview (an officer will always ask). Members of House of Zug must be respectful and ethical in their recruitment strategies. Effort Points are awarded only when an applicant/trial is promoted to the rank of Gladiator. In order to offset the rising GP values in 6.2 and avoid fractional PR values, effort points values have increased. Listed below are all the changes. Visit the EPGP page for more information. EP gained from Progression Raiding has increased from 100 to 250. EP gained from Friday Night Flex has increased from 25 to 100. Minimum EP has been eliminated. Base GP has been increased to 1000. Feedback is essential to the improved operations of any team. In House of Zug, we have a tradition at the end of each raid tier to collect feedback from our raiders to guide the direction of the raid team going forward. Raiders who take the time to fill out this survey and give honest and thoughtful insight will receive EP equal to a full raid night. BRF feedback is due on 07/07/15 (two weeks after 6.2 drops). Let me be the first to say that I am extremely excited to move into what promises to be an exceptional raid tier. We will assuredly face many challenges as a team, but I have more faith than ever that our team is more than up for the challenge!